Chrome plated metal wine glass rack. This glass rack is made to hang from the bottom of any cupboard, shelf or counter. 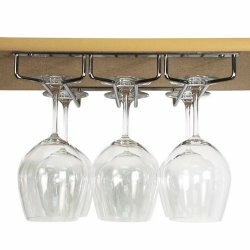 Capable of holding up to 9 wine glasses, this hanging rack can also be used as a perfect drying rack. Display your favorite glasses in style, or hide them out of view inside your cabinet. 10-1/4” deep X 13” wide.